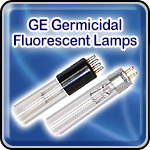 GE Germicidal Fluorescent Lamps - Description: GE Germicidal lamps use a special glass that transmits ultra-violet light in a spectral band that can be effective for sterilisation. A proven technology for the destruction of air-borne bacteria, viruses and mold spores. Improved system efficiency when installed in HVAir Conditioning (HVAC) units by reducing bacterial and mold growth. The UVC wavelength of 254 nm will inactivate bacteria, viruses, mold, and cysts by preventing DNA replication. UV lamps for germicidal applications. Water, air and surface sterilisation. Healthcare; UVC is used to reduce the spread of disease, protecting both patients and staff. UV fixtures are often found in areas where the risk of infection is greatest; such as immuno compromised patient areas or where the probability of transmission is high. Processing Industry: Food may be irradiated to prevent growth of mold and other dangerous organisms before it is packaged. This helps ensure food safety and extends shelf life. UVC lamps are also used within the facility to limit the exposure of food products to airborne micro-organisms. Scientific Labs: In industries that demand a clean, sterile environment, UVC is used to limit the amount of ï¿½liveï¿½ organisms in the air, and to sterilize equipment and surfaces when employees are not in the room. Industrial, Municipal: Residential Water and Pond Treatment. Special UVC lamps are used in some treatment applications as a means of disinfection. This technology serves as a replacement for chlorination in waste water treatment and as an additional protective barrier in drinking and process water applications. Lamps are now widely used in Pond cleansing for both domestic and commercial uses. Commercial buildings: UVC lamps are used as a means of improving HVAC system efficiencies by irradiating coils and keeping them from building up with mold and other bacteria, which reduces the flow rate and costs more to operate. These lamps can also be installed in-duct as a means of improving indoor air quality.